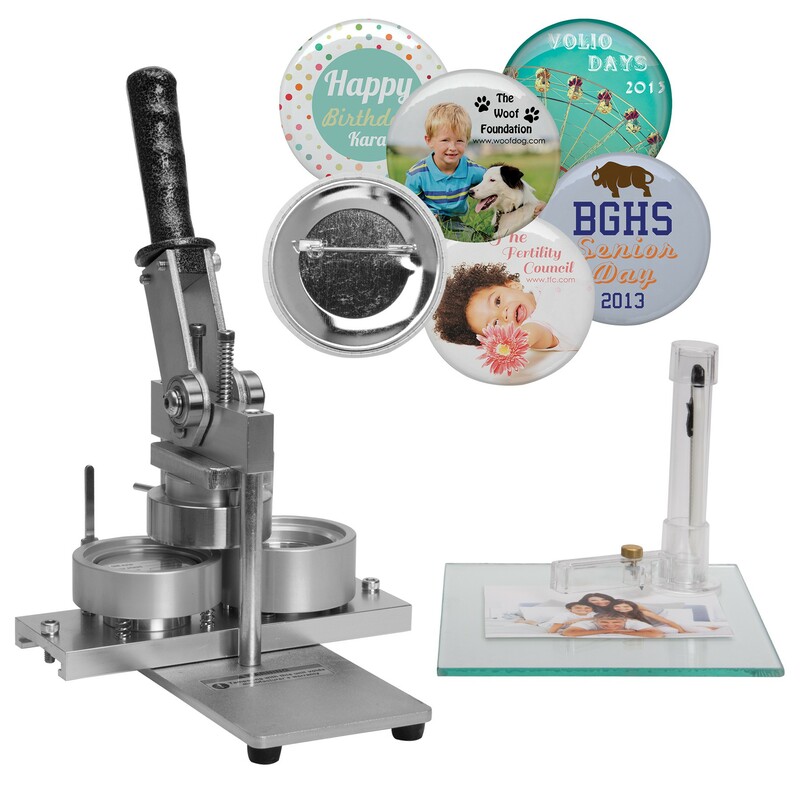 These button makers are great for making campaign buttons, photo buttons, buttons featuring kids drawings and more! Want to see the button machine in action? Click here. Is your button machine jammed? Click here to see how to unjam it. What type of paper would you suggest I use? Any type of regular paper you would use in a printer would work or photo paper. Construction paper and cardstock are too thick and will NOT work with these button machines. Can you make magnets or mirrors? Or only pinned buttons? Yes! You can make mirrors and magnets with this button machine. You can find the mirror parts here: http://www.neilenterprises.com/button-mirror-back-parts.html and the magnet parts here: http://www.neilenterprises.com/button-magnet-back-parts.html. Online we only sell them in packs of 1000. But can sell you a smaller quantity if you'd like. Just give customer service a call at 1-800-621-5584. Is it possible to interchange the 2 1/4 and 3 badge maker part on the machine or do you have to buy an entire different machine for each size? Unfortunately, it is not possible to make different sized buttons with just one machine. If you're looking to make both 2-1/4" and 3" buttons you would need to purchase two separate machines. Would this machine work with pins from a different brand such as tecre? We do not make any guarantees that buttons from other places work with Neil button machines. If you would like to send us a sample of a tecre button part we can try it out for you and let you know if it works with the Neil button machine. Or we can send you a sample of the Neil button part to see if it's identical to the tecre button part. To order a sample just call customer service at 1-800-621-5584.
are you able to change the mould? No, each machine only makes one size. You can use it to make buttons, mirrors, keychains, and more. We do not sell button machines that make multiple sizes. Is there a template that you can download for name badges on the computer to use? Yes, we can create a template for you for any button size you need. Just give customer service a call at 1-800-621-5584 and let us know what size you're looking for. Are there any instructions with the machine? Yes, a sheet with instructions is included. What comes with this machine? If you order the 2-1/4 inch or 3 inch sized button machine, you receive: the machine, a rotary cutter, and parts to make 100 buttons. The 1 inch metal button machine includes a handheld punch to cut circles (instead of the rotary cutter) and parts to make 100 buttons. I would like to know the exact cut size needed for the 2.25 inch button. A good cutter is an investment so I would like to get the correct size. do you offer alternate cutters? For the 2.25" machine, we suggest cutting your circles so they are 2.625". This includes a border that will wrap around the side of the button. If you're looking for a high end cutter, we suggest the Interchangeable Die Cutter (http://www.neilenterprises.com/interchangeable-photo-die-cutter.html) it includes one die. You need the 2-5/8" die (item #9939D). The 1" machine weighs 10 pounds. The 2-1/4" button machine weighs 17 pounds. The 3" button machine weighs 20 pounds. These weights are the shipping weights and include the weight of the button parts and cutter included with the machine. Where is the punch made? The handheld punches are made in Taiwan.